Eurocom Corporation, a leader in the Desktop Replacement notebook technology is releasing a new thin and light notebook powered by Intel's next generation of CentrinoTM technology featuring 533MHz Front Side Bus Alviso chipset. Designed for maximum mobility and performance, the new EUROCOM M400A Cobra model with 15-inch display offers a choice of fully upgradeable and modular video cards such as ATi Mobility Radeon X700 or NVIDIA GeForce 6600 with 256MB dedicated video memory with 16x PCI Express architecture, SRS (Sound Retrieval System) and WOW 3D sound technology. The light weight of the EUROCOM M400A Cobra places it in the 'Thin & Light' notebook category, but there is nothing light weight about the features found under the hood. 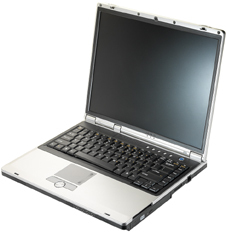 The Cobra offers Intel's next generation of CentrinoTM technology featuring 533MHz Front Side Bus Pentium M processors with Alviso chipset, PCI express video architecture and choice of video memory, dual layer DVD burners, high speed hard drive, the SRS sound system, and all the comforts users have come to expect from a EUROCOM notebook. The M400A Cobra brings the latest surround sound audio system online, so that users can play their DVDs and all audio files in full 3 dimensional, surround sound. This latest cutting edge technology brings a new level of sound reproduction and 3-D audio. The Sound Retrieval System creates a three-dimensional sound image from any audio source with only two conventional stereo speakers. The EUROCOM M400A supports the next generation Pentium M processor (Alviso core-logic 915PM chipset; 90nm) up to 2.13 GHz. Mobile Intel® 915PM Express chipset is a component of Intel® CentrinoTM mobile technology, designed in tandem with Intel® Pentium M processor to deliver exciting new features already integrated in the Intel Pentium 4 processor. It offers support for Intel® High Definition Audio and a high speed PCI Express graphics interface for the most demanding gaming and workstation applications. The 915PM chipset supports up to 2 GB of single or dual channel DDR2 533/400-MHz system memory at lower power along with PCI Express bus architecture for the latest industry peripherals like ExpressCard. Other features include Serial ATA technology. Intel® 915PM Express chipset supports PCI Express based graphics only. The users of M400A Cobra notebook have a choice of upgradeable/modular graphics card based on 256 MB dedicated video memory with 16x PCI Express architecture: ATI Mobility Radeon® X700 or NVIDIA Ge Force 6600 Go. The upgradeable video ushers in a new age of video technology and power management for notebooks. The Cobra delivers extremely smooth, responsive video without sacrificing battery life. The 15-inch display comes in two resolutions: XGA (1024 x 768 pixels) or SXGA+ (1400 x 1050 pixels) with Glossy Screen. With support for today and tomorrow�s drives, the Cobra model is equipped with the future�s hard drive technology. The M400A supports both the legacy ATA (IDE) hard drives and the next generation S-ATA drives up to 100 GB for superior access and read times. Serial ATA takes the original parallel bus to a serial bus architecture. The EUROCOM M400A Cobra thin and light model has been designed for maximum mobility and performance. The power features expected from a desktop replacement notebook are now available in the smaller "Centrino" model. From Alviso chipset, SATA HDD, 1 GB LAN, modular video, FireWire 400, Bluetooth, built-in web cam, SRS sound, dual screen output, DDR 333 RAM, to Dual Layer DVD burners, and more. The M400A features it all in a small and light package ideal for power users on the go.